Welcome back for part two of Megan's guest blog post! If you need to catch up from last week, click here. Also, don't forget that this is the last week of voting for Boston's A List! Vote for us for Best Fashion Blog up until June 12th! Follow the link here- http://boston.cityvoter.com/tara-west-fashion/biz/706254. Thank you for your support and we hope you enjoy these delicious Summer recipe ideas. My current obsessions are spring garlic, asparagus, arugula, watermelon with mint and black squid ink rice or pasta. I am not a recipe follower (probably since I was never good in math), but I'm not afraid to experiment. Fortunately, my open minded husband and 1 year old son humor me and eat anything. This hybrid between green onions and garlic packs a serious punch sprinkled on grilled fish, meats, potatoes, eggs or pizza. My brother-in-law is an organic farmer, so he gave me this beautiful bunch on Mother's Day and it's the gift that keeps on giving when I want some extra flavor. It's a bit spicy, which I love! Since spring garlic is picked before the bulb is mature, the season is short. So get it while you can! I topped my wild sockeye cedar plank salmon marinated with rice wine vinegar, soy, ginger and garlic with these little green and white beauties and it was divine. I eat asparagus mostly when it's grilling season because I love the flavor char marks add to the sweet tender spears. I only buy thin asparagus because I think it tastes better and doesn't get 'mealy' when cooked. No recipe here...just wash, snap the bottoms off to where they naturally break and shake in a container with olive oil, salt and pepper. Just don't overlook them. No one likes them stringy. Asparagus is a great source of fiber, folate and packed with antioxidants. This is the green that stands alone. Seriously all I do is massage the greens with olive oil and add salt, pepper and shaved Parmesan. It's surprisingly delicious every time. It doesn't get soggy either! I love arugula with eggs in the morning or on an English muffin with avocado. Adds spice and freshness to everything from pizza to burgers. It's extremely nutritious too providing more energy, a healthier appearance and defense against disease. On a side note, solid Parmesan is a staple in my fridge that cannot be replaced with the grated kind you buy in a shaker. It's worth the extra money to buy the real deal. The flavor doesn't compare and it's healthier when you look at all the ingredients in the processed kind. My mother-in-law taught me this one. Nothing is more refreshing in the morning or after a heavy meal then juicy watermelon and fresh mint. I cut up a whole watermelon and honestly spend 45 minutes picking every little white seed out of my 'seedless' watermelon so I have a big batch ready for the week. My son loves it and I use it to flavor water and sometimes martinis :) I will also add feta cheese and red onions for a snack or side dish. 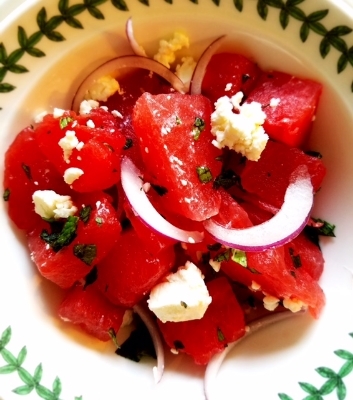 Interesting Fact: Watermelon has more Lycopene then raw tomatoes and is a fruit and vegetable! This is an acquired taste, but if you can get over the appearance then it's worth a try! Squid ink has been shown to stop the growth of new blood vessels which may slow the growth of cancer. I first had squid ink pasta in Venice and it was love at first bite. The rich appearance was surprisingly light, but extremely flavorful. It pairs beautifully with seafood. I recently made it with a white wine and garlic sauce topped with sautéed shrimp, scallops and mussels. I have good luck finding black pasta and rice at Home Goods in the specialty food section. Last week I picked up some black risotto imported from Italy for $3! It went perfect with my cedar salmon and arugula. It tastes better then it looks. Trust me. There's no better time of year then Summer to explore and experiment with fresh produce. The best meals are centered around what is in season and fresh. So throw on your sundress, sandals and tote and hit the Farmer's Market for more mouth watering finds!